Everyone deserves to be pampered while on vacation. Oleo Cancun Playa by Atelier de Hoteles has the spa and wellness center for travelers to improve their mind, body and spirit. 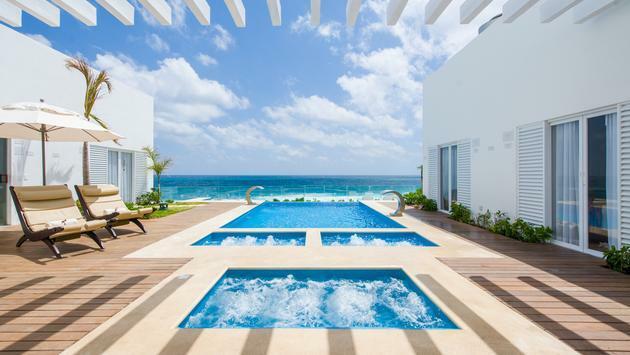 Guests are treated to full luxury at the all-inclusive 5-star boutique resort in Cancun, Mexico. Whether you’re looking to relax and unwind or keep up the workout routine to stay fit on vacation, Oleo Cancun Playa has you covered. After all, an all-inclusive in a tropical paradise should be able to meet the needs of its guests. Start your day off right with splendid spa treatments. At Oleo Cancun Playa, they offer custom-made treatments created by wellness professionals. Depending on your needs and wishes, these professionals are on hand to ensure that your spa experience is the best it can be. Don’t be afraid to indulge and treat your body to a day full of pampering. The infinity pool at the wellness center offers incredible views of the Caribbean. It’s a perfect place to spend a leisure afternoon. With complimentary Wi-Fi throughout the hotel, you can stay plugged in while you relax by the pool after you’ve just had a sensational spa experience. There’s also a fitness center gym on the property, complete with cardio and weight equipment. Plus, there’s a tennis court as well for those who enjoy playing a few games for their exercise. A bonus for guests who book their stay at Oleo Cancun Playa is the wellness gift upon arrival, as you’ll be greeted with a welcome cocktail, refreshing towels and a relaxing hand reflexology during the check-in process. For more information on Atelier de Hoteles, contact your travel agent or visit their website here.